There’s a popular perception of CrossFit, the bare-bones fitness craze that has swept the nation in the last three years. Think lean, ripped, tattooed Millennials grinding their way through intense anaerobic sessions in sweaty Spartan “boxes” lasting as little as 10 minutes. Lots of Olympic lifting, Burpees, and cheating – er “kipping” – pullups. Running? That seems like it has little to do with CrossFit. T.J. Murphy, a longtime endurance athlete and journalist who joined us today on The Fitness Buff Show, says that’s pretty much the view of CrossFit he had 15 months ago when he stumbled into a CrossFit “box” in Los Angeles. Newly-divorced, 47, and suffering from a litany of injuries from 15 years of heavy endurance training, Murphy was willing to try anything. What he found, as chronicled in his terrific new book Inside the Box: How CrossFit Shredded the Rules, Stripped Down the Gym, and Rebuilt My Body, is that a lot of the popular perceptions of CrossFit are inaccurate. CrossFit coaches spend a lot of time identifying and helping athletes correct muscle imbalances and ease athletes into the program so they don’t blow out a joint performing a deadlift of overhead squat. CrossFit places a heavy emphasis on nutrition, advocating a hybrid plan of Paleo and The Zone Diet. As for the kipping pullups, even the most skeptical trainers see the value in them for developing core strength. 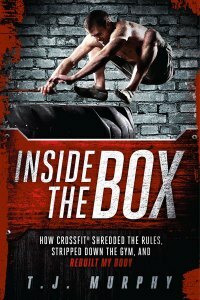 Murphy’s book chronicles his own journey into CrossFit and how ex-gymnast Greg Glassman built a loose empire of 4,000 CrossFit affiliates (up from just 13 in 2005) based on the notion that “constantly varying” workouts of short duration and high intensity that prepare athletes for any physical challenge imaginable are the best way to train. CrossFitters are notorious for disliking running. Though CrossFit has a sister program, CrossFit Endurance, most CF disciples seem content to focus on body-sculpting WODs that stay inside the box. Even though Tough Mudder and Spartan Race closely align themselves with CrossFit, some CrossFitters struggle with the distance of longer obstacle races. 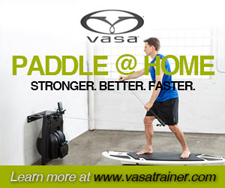 That’s not to say CrossFit can’t be good training for endurance sports. Quite the contrary. We’ve found the obstacle race training sessions very effective at CrossFit affiliate TNL Tampa, where trainer Eric Stratman includes runs ranging from 400 meters to 2 miles into a typical obstacle training WOD on Saturday mornings. Murphy, now 48, thought he needed knee replacement surgery in the summer of 2011, but plans to return to running now that CrossFit has corrected his muscle imbalances, eliminated his back pain, and left him feeling energized in the morning rather than like a creaky old man getting out of bed. He’s going to apply CrossFit to his marathon and triathlon training, figuring the efficient nature of CF will enable him to get faster while logging far fewer miles. Though there now seems to be a CrossFit box in every office park in America, we’re guessing CrossFit will only get bigger – especially as endurance athletes discover the value of getting inside the box. 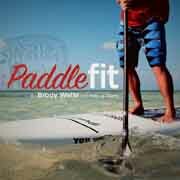 Listen to our Fitness Buff interview with T.J. Murphy HERE.